This theme must appear prominently within the poster. The contents of the poster must correctly depict safety-related behavior and procedures by representing proper placement of passengers in or around the school bus in relation to one another. (For example, if a poster contains a student walking behind the bus, the poster will be disqualified, because the areas around and behind the bus are in the DANGER ZONES, and, therefore, do not convey the desired message. Other unsafe representations to avoid are children hanging out of the windows, standing or walking in the bus, and being too near the exterior of the bus.) Within each poster, at least a portion of a yellow school bus must be represented. The poster must be the original work of the student. Artwork should be accomplished in the classroom, under the supervision of the teacher. The posters may be constructed of quality tag, poster illustration board, or heavy paper: construction paper may be used as the base for the artwork, etc., but the finished product must be mounted to quality tag poster. 11” X 17” only; either Vertical or Horizontal Axis is Permitted. Colors - Unlimited use and number. Methods of achieving colors and other aspects may include print, felt pen, crayon, cut paper, markers, etc. Lettering must be original, free-hand work by the student; stenciled, preprinted, manufactured stick-on or press-on letters or tracings may NOT be used. Lettering should be clearly legible within whatever portion of the poster it may be used. AVOID use of the School District NAME to preserve anonymity. AVOID the use of: wood, plastic, glass, metal. or similar materials in the construction of the poster. AVOID the use of collage materials. AVOID the use of copyrighted characters such as cartoon figures, television celebrities, or any part or portion of any item which may be protected by Copyright laws, such as magazines, newspapers, books, photographs, etc. This information must be typed or clearly printed on the entry blank and securely glued to the REAR of the poster. ATTENTION: Please accurately follow all requirements and restrictions, as failure to do so will subject the entry to disqualification. 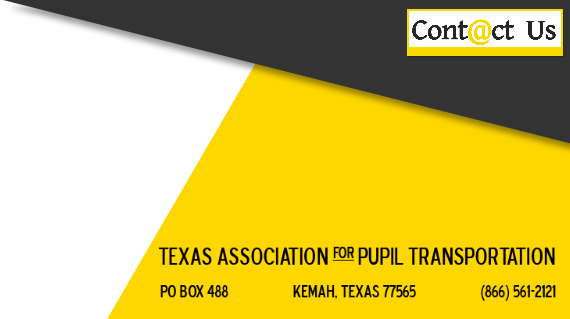 All winning regional entries become the property of The Texas Association for Pupil Transportation (T.A.P.T.) which reserves the right to modify any poster for reproduction purposes. Posters may only be submitted as entries to the state contest by one of the affiliated chapters of TAPT. Entries will not be accepted for the state contest by individual schools or districts. Various methods of determining levels of winners may be established at district discretion. A suggested progression of selecting winning entries would be to judge winners at each campus, followed by district-wide winners. A meaningful gesture would be to involve drivers who serve a specific campus to judge its winners. Then, elevate all campus-level winners to a district-wide judging where the final first place winners are selected for each Division. Upon selection of district first place winners, these should be submitted for judging at a T.A.P.T. affiliate meeting in April or early May. 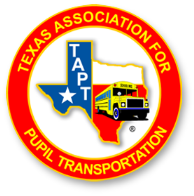 (For those districts whose transportation personnel are not active members of the T.A.P.T., their entries may be submitted to the closest member affiliate for inclusion in area selection.) The final selection of affiliate winners are to be mailed to the School Bus Safety Poster Committee Chairman by May 15, 2016. Please mail only one poster from each Division for entry in the state contest. Please encourage enthusiastic participation in this educational contest. Note: It is not required that the posters be produced during the National School Bus Safety Week Campaign; the primary goal is participation in time to achieve completion for the various levels of judging.